Time flies when you’re having firn. RAID testing is coming to a close, and with it, my first Antarctic field season. I have gained invaluable experience over the past four weeks at this beautiful field site, from the mechanics of camp life to troubleshooting equipment. And there’s nothing quite like seeing what you study firsthand, poking and prodding it, cutting and weighing; it turns equations and graphs into physical reality. In the first part of the field season, I completed a side project alongside the RAID field trials: measuring the density of the firn from the surface, where it’s simply snow, to 130 meters, where at this site it has turned to ice. 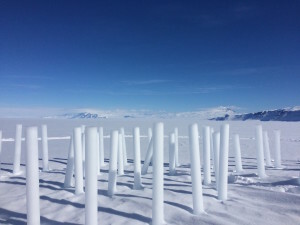 I could see and feel the structure of the firn changing in the thin slivers that chipped off the cores: first, at the surface, opaque snow that I could dent with my fingers; then distinct little ice crystals pressed together; then more cohesive ice with a maze of interconnected air spaces like tunnels in an anthill; finally, at 130 meters (~425 feet) below the surface, translucent solid ice with tiny separate air bubbles. I will use this density profile to improve a widely-used model of firn depth, an important parameter to guide ice drilling. In fact, we’ve already used these density measurements to inform the RAID drillers the depth they had to auger in order to make a seal with the packer for drilling fluid. 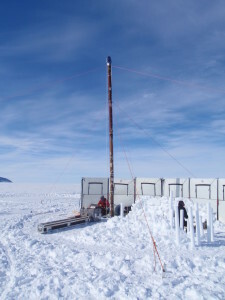 Firn coring setup at the Daisy Site, 500 meters from the main camp. 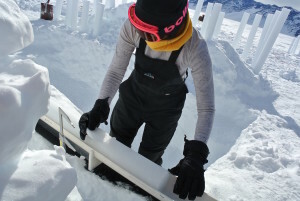 Jessica measuring the density of firn cores in a snow trench. Jessica and Jeff taping tubing to the drilling cable. The tubing is used to pump air out of the firn for later sampling in San Diego. A thin section of firn with a maze of interconnected air spaces. 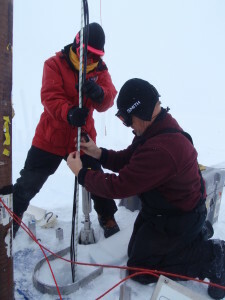 Firn cores that have been measured—before we melted them for drinking water! After I finished the density profile, I measured the temperature in the borehole left over from the firn coring. I lowered a thermometer to the bottom of the borehole and pulled it up by 15 meters every 12 hours to see how the temperature changes with depth. If the surface temperature had been the same for many years, you’d expect to see the temperature decrease as you move from the bottom of the borehole to the surface, since the air above is colder than the ground heating it from below. However, I saw the temperature increase towards the surface—a sign of global warming! I have been observing the ups and downs of RAID testing, as well. Witnessing the team of scientists and drillers working together to diagnose problems and strategize solutions within the unique resource, weather, and time constraints of Antarctica has been really valuable for me as a scientist-in-training. 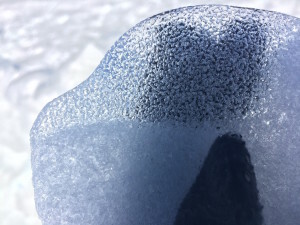 I now have a sense for the quirks of ice, how it melts, packs, and cracks like no other material. Since the last update, we’ve been working through blockages in the fluid recirculation system. Turns out proper winter storage is really important, or else any remaining water freezes throughout the complicated arrangement of of pumps, tanks, filters, and connecting hoses. We’ve noted several improvements to make to the system components and winterizing procedures to avoid these problems in the future. In between observing the drilling and logging the borehole temperature, I’ve spent much of my time on outreach and communication—an odd focus in this isolation, but a fun and rewarding one since I’ve been afforded the rare opportunity to be here. I’ve been filming and editing short videos to show via the Internet what it’s like to live and work in Antarctica. One is a cooking video where I make a loose interpretation of mapo tofu, a Sichuanese dish, with field modifications including peanut butter and Worcestershire sauce. Another chronicles a day in the life at RAID camp. I’m learning editing and storytelling skills along the way—and patience as my phone can only film a few minutes in the cold outdoors! I’m grateful for the many laughs and lessons throughout the season, and for the awesome women in camp who have been a great support. While I’ve learned a lot here, I’m looking forward to reconnecting with my community and my other interests when I get back to California: cooking with family and friends, dancing, and organizing with my peers for social and environmental justice. Hoping for much success in the rest of this field season—so long until the next one! 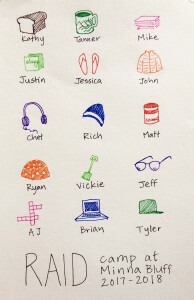 The personalities of Minna Bluff camp. Jessica Ng is a student at the Scripps Institution of Oceanography at UC San Diego.